A team of Turkish investigators searched the Saudi consulate in Istanbul for a second time as part of a probe into the disappearance of journalist Jamal Khashoggi, according to an AFP correspondent. Turkish police on Wednesday also carried out a search of the residence of the Saudi consul to Istanbul, Mohammed al-Otaibi, a day after he flew out of Istanbul for Riyadh. Khashoggi, a former regime insider who became critical of Saudi Arabia's Crown Prince Mohammed bin Salman, wrote articles for titles including the Washington Post. He has not been seen since he stepped inside the Saudi consulate in Istanbul on October 2. Turkish officials have said they believe he was killed there although this has not been confirmed by Saudi Arabia. At around 4:40 pm (1340 GMT) a team of a dozen police and prosecutors, including forensics experts in white overalls entered the residence of the consul, who was at the consulate when the alleged assassination of Khashoggi took place, according to Turkish media. The investigators examined the garden, and some could be seen on the roof of the building. A drone was also used over the building, according to an AFP journalist at the scene. The investigators left the residence around 1:30 am, but some of them headed to the nearby consulate to conduct a search, which was continuing into the early hours of Thursday. 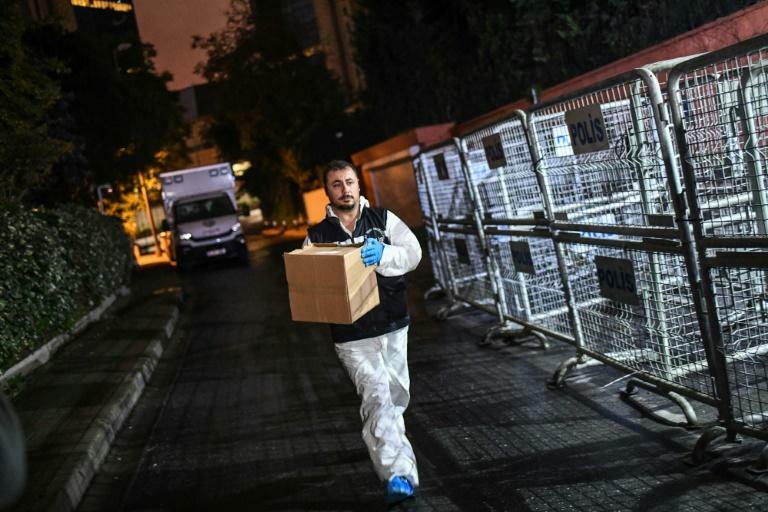 Turkish police on Monday night carried out an eight-hour search at the consulate, taking away soil and DNA samples.